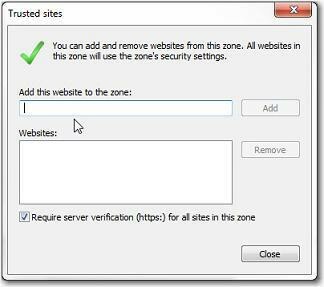 To ensure all functionality of your SharePoint site the URL must be listed within your browsers Trusted Sites. 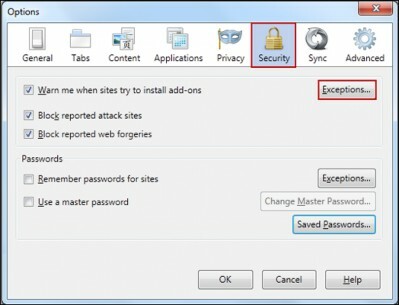 This can also resolve SSL certification errors. Under Privacy, if you want to allow cookies from most sites, click 'Clear all current history' to open the Clear Recent History window, where you can select to Accept cookies from sites, but then enter some Exceptions to prevent cookies from specific sites. Under Security, if you have the "Warn me when sites try to install add- ons" box checked, you can override this warning for certain sites by clicking Exceptions. 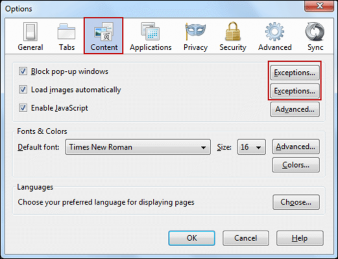 In the Exceptions... dialog box, enter the web site URL in the Address of web site: field, then click Allow. Under Advanced, click the Network tab. There is a checkbox labelled Tell me when a website asks to store data for offline use. Here you can add Exceptions that would override this rule.